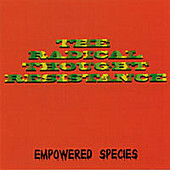 Judging the name of the band, The Radical Thought Resistance sounds like a straight up, mohawked punk rock band complete with safety pins for jewelry and contempt for everyone. However, this (for the most part) NYC duo's music lies somewhere between the expansive rock of Incubus with the socially conscience tip of Living Colour. Mixing in elements of rap rock, funk metal, and alternative, RTR's top-notch production and abundant positive messages through both sung lyrics and spoken word junctions create an element of self-awareness and an urging to look deep inside that you just can't get from an Offspring record. Add in some flawless fretwork and a true sense that this band believes in what they're singing about, and The Radical Thought Resistance's seven-track release will lift your spirits and sing to the soul that you sold to rock 'n' roll.